12 O'Clock Track / Music 12 O'Clock Track: Warm up with the Light Touch Band's "Chi-Ca-Go (It's My Chicago)"
So it got cold out really fast this week. It happens every year, and still, every time it does, everyone takes to their social media to unleash countless "OMG IT'S SO COLD WHY DO I LIVE IN CHICAGO?" updates. I get it, this weather is a total bummer, but don't hate Chicago for it. 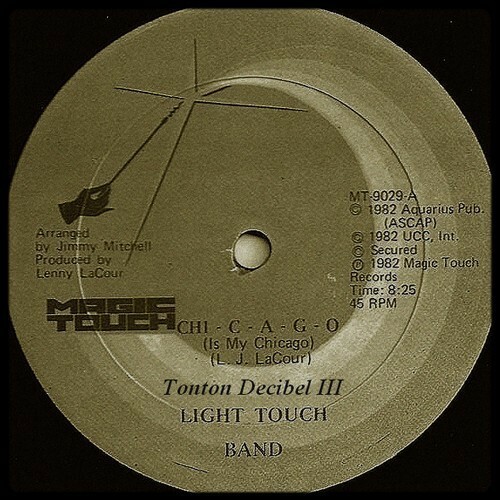 Here, take a listen to today's 12 O'Clock Track, "Chi-Ca-Go (It's My Chicago)," by the obviously local Light Touch Band. This record came out in 1982, appearing to be the only thing these guys ever released, and it is eight minutes of sheer brilliance. An upbeat funk number driven by a catchy slap-bass line and a schoolyard-chant chorus, it's a love letter rapped to the dear city we call home. This song boosted my Chicago pride, frigid weather and all, and I couldn't imagine anyone feeling anything else after hearing it.